2011-ES-98 is looking for volunteers! Short term project will start in May/June 2012. Number of hosted volunteers is 2 and duration of their projects could be between two weeks and two months. 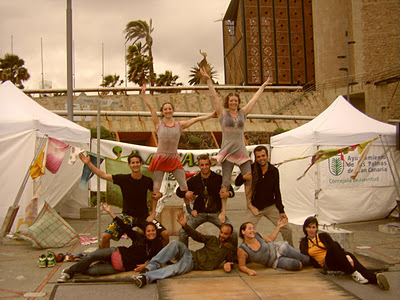 We are looking for volunteers willing to collaborate during and right after the Circus Festival which is organised by the association every year in May. TASKS FOR VOLUNTEERS DURING FESTIVAL: Help in the implementation of the festival. They will be involved in several fields, such as promotion, contact with the companies, selling tickets, information point, technical help (help in the coordination and supervision of the different scenes, transfer of sceneries, decoration…). 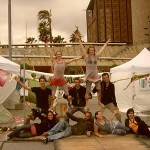 Take part in the festival, if they like circus (workshops, debates, spectacles…). Help in the acreditation tasks. Long term project with duration minimum 9 month will start in June/July 2012 (flexible). We are looking for 1 person which would be supporting the association in its daily projects and activities (social, youth and cultural), and which would also work in promotion of european projects and activities. TASKS FOR LONG-TERM PROJECT: Volunteers will be actively associated to the process of internationalisation of hosting organisation and actively work in the field of artisitc production and organisation of spectacles/festival, as well as in youth services. Traducing promo material of the companies and artists, support in the inscription of the association within the european youth and cultural network, active participation in the diffusion and visibility of the association in the city. Logistic support during the cultural events (promotion, bringing the material…) and youth events (group leading, helping in the realization of the workshops…). SELECTION CRITERIA FOR: S/he should be dynamic, enterprising, active and participating person with knowledge of the cultural sector/ social and youth (with some interest or experience in those fields). Have a basic level of Spanish so they can start to help with basic tasks. The selection will be made after receiving cover letter from volunteers interested in project. Each candidate will be replied with the answer positive or negative. In the case we are interested in one applicant, we will reply by email, making a few more questions to be clear about the interests of the person. We will also conduct a Skype meeting, to assess the level of motivation of the young, the language, difficulties. Interested? Send an email with your CV and motivation letter to sve@mojodecana.org until deadline 10th January 2012.